Lily-Rose Depp hit the red carpet this evening(May 17th) at the 70th Cannes Film Festival opening ceremony and the premiere of 'Ismael's Ghosts' at Palais des Festivals in Cannes, France. Wearing a CHANEL of course, she wore a look hot off the RESORT 2018 runway. Her white short sleeve ankle length silk dress featured flirty cut-out sides and a gold & silver flower embellishments on the shoulder & waist. Beauty wise, she kept things simple with a minimal make-up look and center part waves. 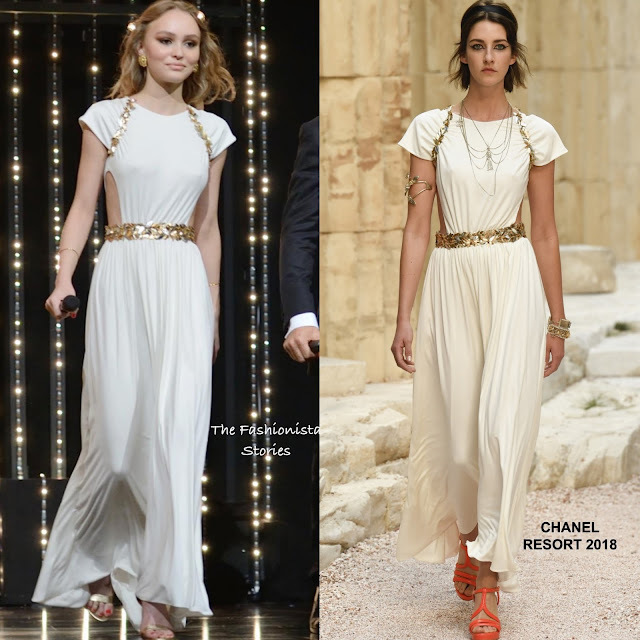 Lily looked simply pretty in her Grecian inspired dress which was topped off with gold accessories. What do you think of Lily's look?